Carwari International originally started as an organic tahini manufacturer, and now we stock more than 30 different products, such as tahini, sesame seeds, sesame oil, sesame flour, spreads, agave nectar, drinkable vinegar, nuts, etc. All of our products are certified organic and gluten free (except Miso Soup which contains wheat). For more information, please visit www.carwari.com. 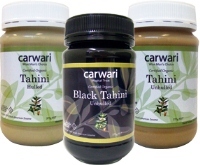 Our 'black tahini' has been one of the most popular products of Carwari brand. 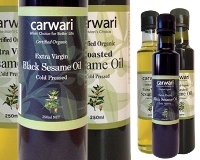 Carwari is the only manufacturer who produces 'Australian made' black tahini. Not to mention about its unique color, it has amazing flavour and is full of nutrition (high anti-oxidant, minerals and vitamins). It is ideal for all sorts of cooking and baking: cakes, spreads on toasts, salad dressings, hummus or ice cream. Carwari suggests “Wiser Choice for Better Life”. We would like to provide healthy food alternatives in order to assist improving the quality of your life.